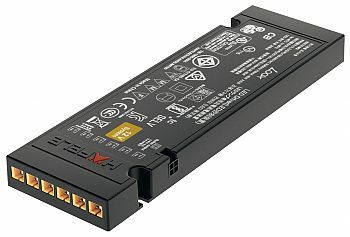 Hafele Loox 12V DC LED Driver features an integrated switching function and connections for all of the most popular types of switches. For use with the Hafele Loox 12V Lighting systems. 12V DC constant voltage; 0-40 Watts max. Input Voltage: 100-240V; 50-60 Hz. IP20 Protection; Class 2; Efficiency Lever VI. Plug and play technology for easy installation. Features an integrated port for a wide selection of switches. Lead length from driver to switch max. 20' (6M). Set includes: Driver with 6-ports for 12V lights, 1 slot for switch, 78-3/4" (2m) power cord with U.S. plug, and mounting hardware. Note: This product is also known as HAF-833.74.901, HAF-833-74-901, HAF-833.74.962 on other websites.